de Boer G, MD Ivey, B Schmid, S McFarlane, and R Petty. 2016. "Unmanned Platforms Monitor the Arctic Atmosphere." Eos, 97, 10.1029/2016eo046441. In the Arctic, unmanned aircraft systems (UAS) and tethered balloon systems (TBS) can make crucial atmospheric measurements to provide a unique perspective on an environment particularly vulnerable to climate change. 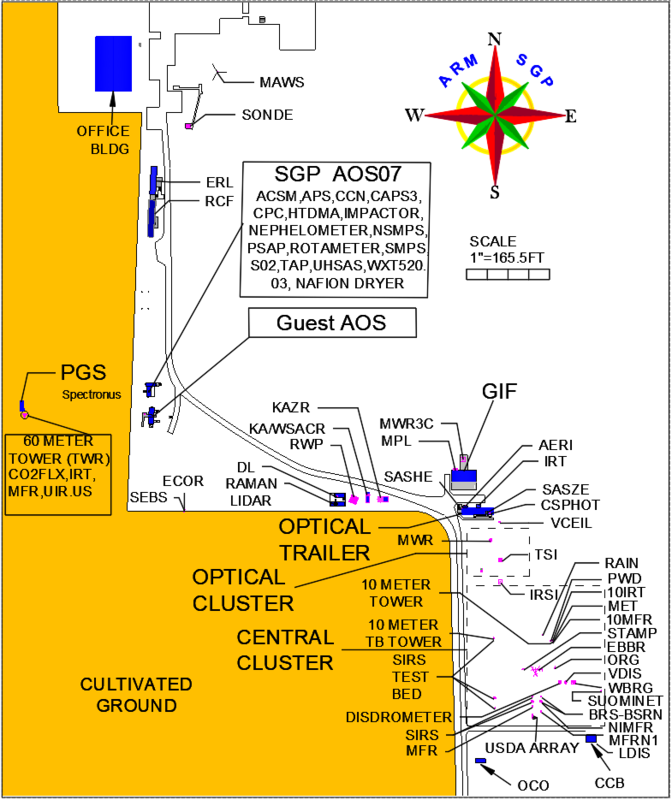 To enable research on processes important to climate change in the Arctic—those involving aerosol particles, clouds, and the surface energy budget—the U.S. Department of Energy (DOE) supports the Atmospheric Radiation Measurement (ARM) Climate Research Facility's Oliktok Point site, which includes areas of special-use airspace that allow more flexible operations of UAS and TBS for climate research in the Arctic. The DOE ARM Climate Research Facility initially worked with the Federal Aviation Administration (FAA) in 2004 to develop areas of restricted and controlled airspace to support use of UAS and TBS that observe the arctic atmosphere. The first area, designated R-2204, consists of a 4-nautical-mile-diameter cylinder centered on Oliktok Point and includes two height ranges, the first extending an elevation of 1500 feet and the second extending from 1500 to 7000 feet. Early on, this airspace hosted TBS activities during the ARM Mixed-Phase Arctic Clouds Experiment (M-PACE), which investigated cloud microphysics and radiative properties (Verlinde et al. 2007). More recently, it has been activated to support a variety of campaigns using unmanned and manned aircraft, as well as TBS. Spurred in part by the observed rapid decline in arctic sea ice and the need to better understand the evolving arctic atmosphere and its interactions with the surface, DOE more recently worked with the FAA to develop a new block of airspace for researchers to use, extending approximately 700 nautical miles over the Beaufort Sea to the north of Oliktok Point (see Figures 1 and 2, right). This space, designated warning area W-220, is 40 nautical miles wide and divided into two altitude ranges (0–2000 feet and 2000–10,000 feet) and will provide critical access for scientists to the environment overlying the Arctic Ocean. To support scientific campaigns stemming from the use of these areas of airspace, the DOE ARM Climate Research Facility has deployed the ground-based third ARM Mobile Facility (AMF3) to Oliktok Point until at least 2019. The facility is one of three that DOE operates and is equipped with a wide variety of instruments, including remote sensors for measuring cloud properties and energy transfer in the atmosphere (e.g., radars, laser-scanning lidar mapping, and radiometers), sensors for surface weather and airborne pollutants, and towers of instruments that measure the exchange of carbon and water vapor between the air and the ground. Finally, to fully take advantage of the airspace at Oliktok Point, ARM is bolstering its UAS and TBS equipment with a variety of new aircraft and instruments that will begin flying in 2016. Sandia National Laboratories, which manages the ARM measurement sites on Alaska’s North Slope, already operates a variety of TBS at Oliktok Point and has expanded their capabilities through a variety of miniaturized atmospheric instruments. For both UAS and TBS, this expanded effort will include sensors to measure clouds, aerosols, radiation, thermodynamics, and surface properties. The ARM Climate Research Facility plans to operate these craft in both routine and focused campaign environments at Oliktok Point over the coming years. Measurements from the platforms discussed above will be made available to the international research community through the ARM Data Archive. In addition, the airspace will be available for the scientific community to propose investigator-based UAS operations as part of ARM-sponsored field campaigns. Through these means, opportunities exist to gain critically needed new insight into the physical processes related to clouds, aerosols, radiation and their combined impact on climate. Figure 1: Gijs de Boer and Jack Elston prepare to launch a DataHawk UAS at Oliktok Point, while the ARM tethered balloon operates in the background. Figure 2: A DataHawk2 UAS flies over the AMF3 at Oliktok Point during the ERASMUS campaign in summer 2015.